Physician, mathematician, astrologer, and poet; born in 1588 or, according to some, in 1593, at Lisbon; died either at Florence or at Leghorn in 1662 or 1668; son of the Marano physician Fernando Bocarro. On completing his medical and mathematical studies at the University of Montpellier, he returned to his native country, where he soon acquired a reputation as a physician, among his patients being the Duke of Bragança and the Archbishop of Braga. In 1625 he went to Rome, where he devoted himself to mathematics and astrology, and entered into friendly relations with Galileo Galilei, who encouraged the "learned astrologer," as he styled Rosales, to undertake a work on astrology. Rosales then lived for some time at Amsterdam, where he openly avowed Judaism, taking the name of Jacob. Some time before 1632 he went to Hamburg. In July, 1647, he was appointed "Comes Palatinus" by Emperor Ferdinand III. He then returned to Amsterdam, and subsequently went to Italy, where he died. Rosales published the following works: "Tratado das Cometas Que Aparecerāo em Novembro pas. de 1618" (Lisbon, 1619); "Status Astrologicus sive Anacephalæosis da Monarchia Lusitana," a Portuguese poem in 131 (133) octaves, dedicated to King Philip III. of Spain and other princes (ib. 1624; 2d ed., with Latin translation, Hamburg, 1644); "Luz Pequena Lunar: Explicaçào de Primeiro Anacephalæosis, Impr. em Lisboa 1624" (Rome, 1626); "Poculum Poeticum," in praise of his friend Zacuto, printed in the latter's "De Medicorum Principum Historia" (Amsterdam, 1629 et seq. ); "Brindis Nupcial é Egloga Panegyrica Representada dos Senhores Isach e Sara Abas" (Hamburg, 1632); "Regnum Astrorum Reformatum" (ib. 1644), on astronomy; "Foetus Astrologicï Libri Tres" (ib. 1644), Latin poem in 170 hexameters, appended to the "Status Astrologicus"; "Armatura Medica, sive Modus Addiscendi Medicinam," in vol. ii. of Zacuto's collected works (Lyons, 1644). Rosales wrote also "Επος Νοητικον sive Carmen Intellectuale," in Latin in nine sections, and "Panegyricus in Laudem Eximii . . . Viri Menasseh ben Israel" (Amsterdam, 1639), in honor of Manasseh b. Israel's "De Termino Vitæ"; and an ode and epigram (Hamburg, 1633) in Portuguese in praise of Moses Abudiente's grammar. A work by Rosales entitled "Verdadera Composicion del Mundo Mathematico e Philosophico" is said to be extant in manuscript. 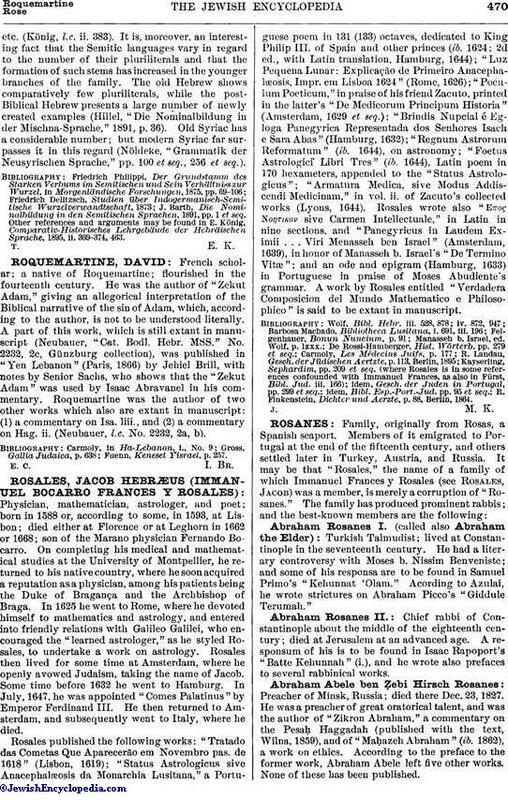 R. Finkenstein, Dichter und Aerzte, p. 88, Berlin, 1864.